Campers and outdoor enthusiasts will love this lightweight storage hack for keeping bathroom tissue high and dry. Cut the pop bottle in half. Keep the capped end. Using a nail and hammer, create a small hole in the bottle’s cap. Cut a 5″ piece of twine. Tie one end around the neck of the bottle. Thread the other end through the hole in the cap from the top and knot it. 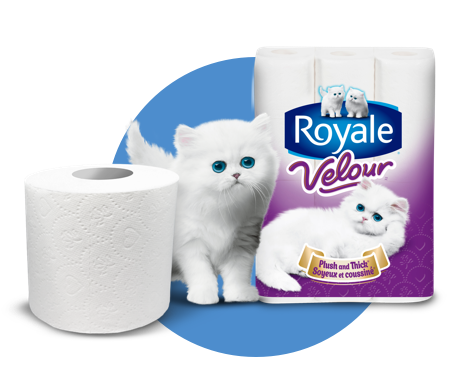 Take your ROYALE® Velour™ and reaching up into the centre of the roll, pull some tissue loose. Place the ROYALE® Velour™ inside the pop bottle. Thread the tissue (just barely) through the pop bottle’s spout. Cut the bottom out of your plastic bag. Keep the top of the bag sealed and place the open end around the top of the pop bottle. Tape the bag to the bottle, making sure the seal is tight. Fasten the paper clamp to the re-sealable end of the bag. Loop a piece of twine through the clamp’s end and tie it around a tree branch. This inexpensive container protects your bathroom tissue from moisture, and because it’s refillable and waterproof, you can re-use it every time you go camping.